Welcome to Bonaire and to Chachacha Beach Apartments! Make your holiday on the Dutch Caribbean island Bonaire an unforgettable experience by staying at one of the Chachacha Beach Apartments! Named after a little beach in front of the apartment building, these oceanfront apartments on the boulevard of Kralendijk are the perfect location to lodge on the island. The spacious apartments of 145m²/1561sq feet, each with two bedrooms with own bathrooms, are ideal for a holiday with family or friends. The apartments are all single storey, have a living room with open kitchen, terrace and direct views over the Caribbean Sea. The view over the sea with the bobbing boats on the turquoise blue water and Klein Bonaire as background, is a true feast for the eyes! The apartment building is surrounded by a beautiful garden and 20 meters/ 65 feet away from the Chachacha beach. This beach with coral sand is ideal for swimming and is loved by many divers as shore diving spot. The apartments are also nearby the town centre of Kralendijk were all the shops, bars and restaurants are. 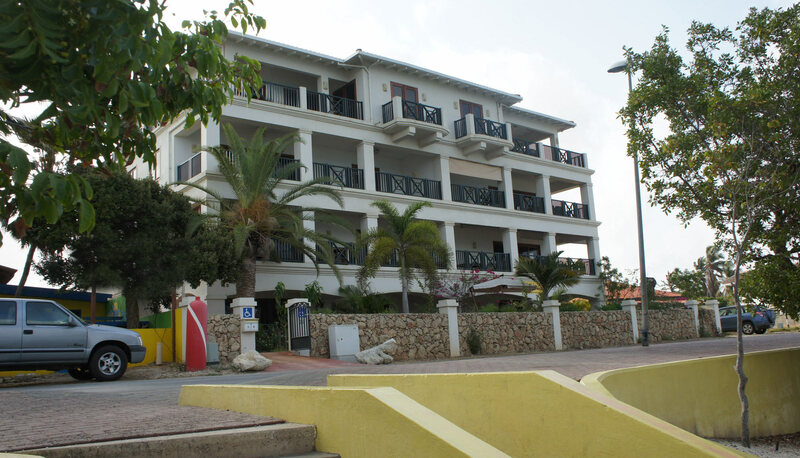 Spacious ground floor apartment with views over the Caribbean Sea. The apartment has two bedrooms with each a bathroom, combined living room with kitchen, covered terrace and direct access to the beautiful garden. The apartment has WIFI and is equipped with air conditioning and ventilators. Spacious ground floor apartment with views over the Caribbean Sea. The apartment has two bedrooms with each a bathroom, combined living room with kitchen, covered terrace, direct access to the beautiful garden and laundry room. Apartment on the first floor (second storey) with panoramic views over the Caribbean Sea. The apartment has two bedrooms with each a bathroom, combined living room with kitchen, covered terrace with roller and solar shades and laundry room.